Since travels to visit Mr. Myrt's side of the family took Ol' Myrt here away from her computer, we're having to play catch-up. But no worries. 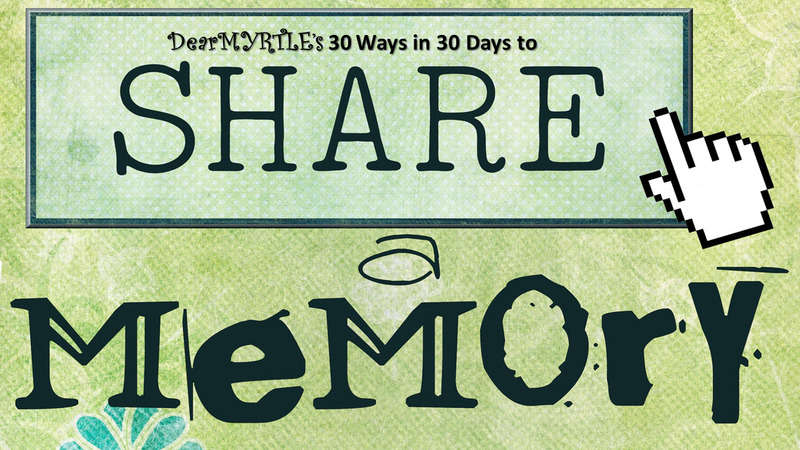 Here's the line-up of previous posts with videos and a lightening round to bring us up to date with our #30Waysin30Days SHARE A MEMORY series. 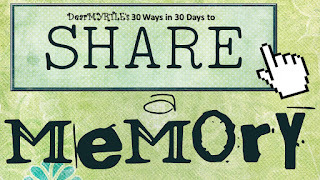 Looks like our friend Amy Johnson Crow has a genealogy research prompt for the month of October called 31 Days to Better Genealogy. 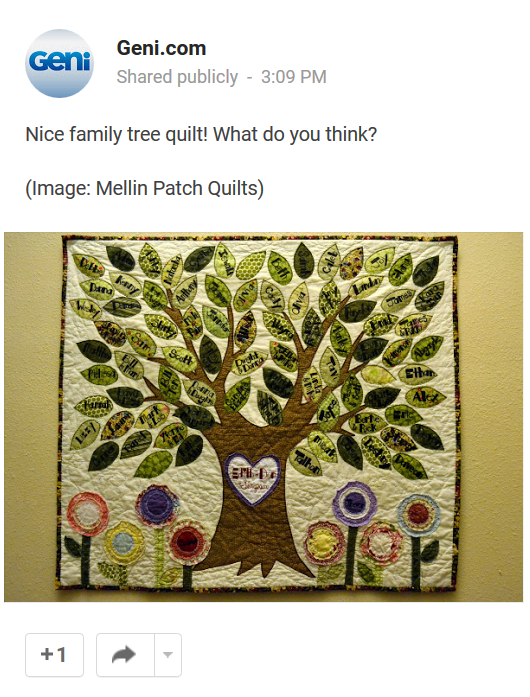 So instead of a major genealogy do-over, Amy will provide ideas each day in October to help you spruce up your methodolgy and make progress with family history research. We've got two WACKY Wednesday hangouts this week - one this evening and one on Friday. Can you have a WACKY Wednesday on Friday? Certainly! Both hangouts are designed to bring new information to light, just in time to help family historians get their jobs done. That last statement begs the rhetorical question: Are we ever done? I think not, but I digress. WACKY Wednesday - Fraternal Organizations, featuring +Jen Baldwin whose pet project is documenting fraternal organizations on her facebook group by the same name. Powerful #genealogy breakthroughs happen in our video hangouts. Tune to see which of DearMYRTLE's very distant cousins will visit to explore this topic in depth. WACKY Wednesday on Friday - HELP Files. Seems everyone is complaining about problems with websites and software, yet few realize HELP is already there. DearMYRTLE and Cousin Russ canvas a few resources about overcoming the technological challenges rather than just grousing about them. WOW, the National Genealogical Society is getting spunky and techie in promoting the 2016 NGS Family History Conference. Check out this YouTube video featuring Angie Bush, Elizabeth Shown Mills and Thomas W. Jones. Even the music is compelling. Way to go NGS - on to Ft. Lauderdale! Tune in to this week's WACKY Wednesday featuring one of our favorite NextGeners Jen Baldwin. She's been collecting info on secret societies, retired military organizations and such for years. I'm sure one of my very distant cousins will thoroughly enjoy hosting this hangout. Before Mr. Myrt takes me for dinner, I'll be sure to remind my cousin that congratulations are in order. Jen was just appointed FindMyPast.com's Data Licensing Manager for North America. 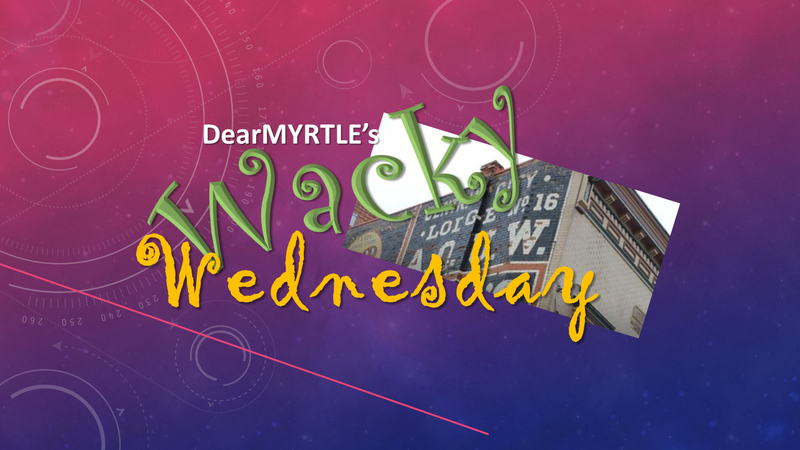 Sure, you can watch the video feed right here, or catch the archived video on DearMYRTLE's YouTube Channel embedded below, but it's much better to JOIN the DearMYRTLE G+ Community to watch and comment on WACKY Wednesday -Fraternal Organizations. That's where we will be posting all comments and links! Powerful #genealogy breakthroughs happen during our video hangouts. 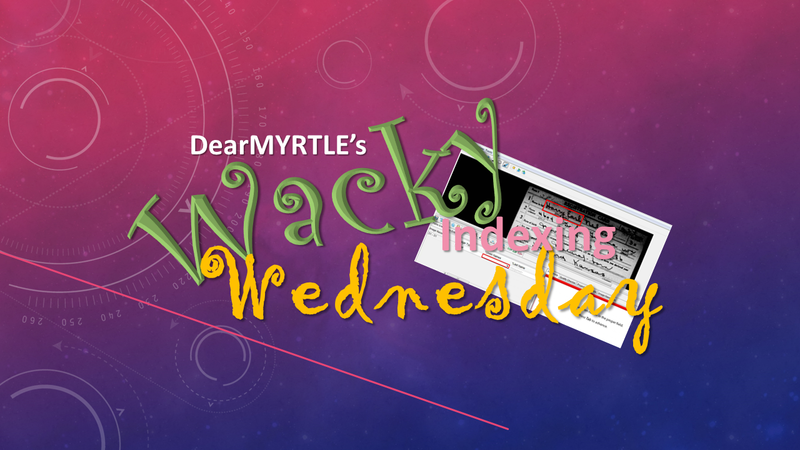 Come on over to see which of DearMYRTLE's very distant cousins will visit to explore the FamilySearch Indexing software *live* during tonight's hangout. 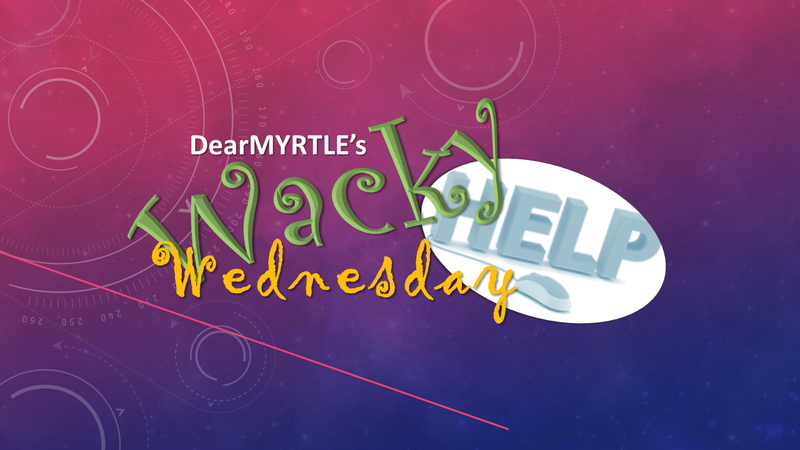 Sure you can watch this WACKY Wednesday video stream here, but it's more fun to head on over to DearMYRTLE's Google+ Community where you may view AND comment before, during and after the live hangout. WHERE in DearMYRTLE's Google+ Community? Just a few minutes ago, our friends at FamilySearch published "Be a Part of RootsTech—Submit your Family Memories!" by Chad K, Schumacher. The idea is to upload a video or pictures to be considered for the opening segment of the 2016 RootsTech Conference. And one entry will win a full pass to the conference itself. The next #30Waysin30Days segment will show you what it looks like when uploading a video to your YouTube channel. Facebook or Google+ are two different resources for family historians. Say what you will, my DearREADERS. Google+ is here to stay. 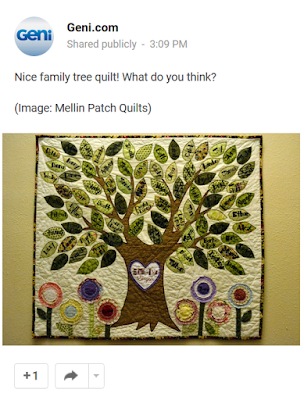 In fact, Google is planning enhancements designed for focused interest groups, like our DearMYRTLE Genealogy Community, where substantive content can be shared, rather than lost 'in the stream' so to speak. #30Waysin30Days SHARE A MEMORY Can this desk speak? Perhaps you are fortunate to have inherited a few heirlooms like Mr. Myrt. This is his "Nanna's Desk." Now, to my grandchildren, they know it as Nanna's desk, but they don't know it doesn't descend through my side of the family. Mr. Myrt is their step-grandfather, and this heirloom comes to him from his maternal grandmother Anna Louise Halverson born 9 Sept 1883 in Chicago, Cook, Illinois and died 14 July 1969 in Sioux City, Woodbury, Iowa. On 2 May 1908 in Sioux City, Woodbury, Iowa, she married Ole Jurgen Sogge, who was born Jun 1876 in Christiansund, Norway and died 25 July 1925 in Sioux City, Woodbury, Iowa at the young age of 49. I've written about him before in my post titled Ole J. Sogge, 1st SD Volunteer Infantry. 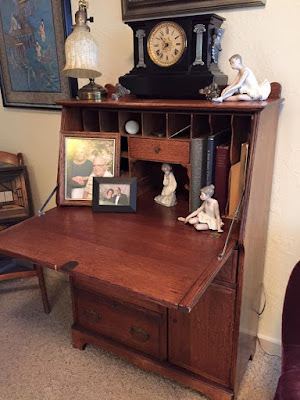 IMAGE: "Nana's Desk" from the author's personal collection. Though now the desk graces a spot in our front parlor, it was once the work space of a business-savvy widow. View this short video to find out more. These are the types of memories we need to hand down through the generations. In particular keep an eye out for what I learned about an circa 1920s white porcelain door knob I found in the desk this afternoon along with Ole's pocket knife. After a brief hiatus, we return with another suggestion for sharing family memories. Facebook is arguably the largest social media space, so why not create a Facebook Group for your family to share memories about family members? Remember you are going to set up a GROUP not a PAGE, to more readily encourage posts from your group members. Ol' Myrt here has her genealogy group on Facebook for my DearREADERS. It is public, but any posts must be approved by admins, to keep the spammers out. We have a private Orcas Island Family Group - where we post all important communication before during and after a family retreat. This has proved more reliable than text messages and email. We know which ferry to meet on, and where to gather for dinner. We planned a week of family meals when on retreat to my sister's Timberlake cabin in the woods in a private, family members-only, Facebook group. Folks who watch Mondays with Myrt know that +Cousin Russ and I use Feedly to pull all our favorite blogs into one location for easy reading. With Feedly.com we don't have to click here there and everywhere all over the net to see what's trending in the world of genealogy. There's even a Feedly app for our tablets and smart phones. 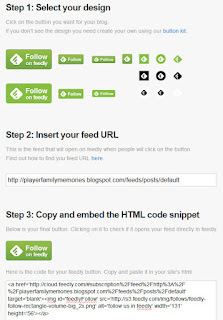 Adding the "Follow on Feedly" button to your blog is a service to your readers and ensures they won't miss a single one of your posts. -- STEP 1: Select your button design There are also directions for creating your own button. 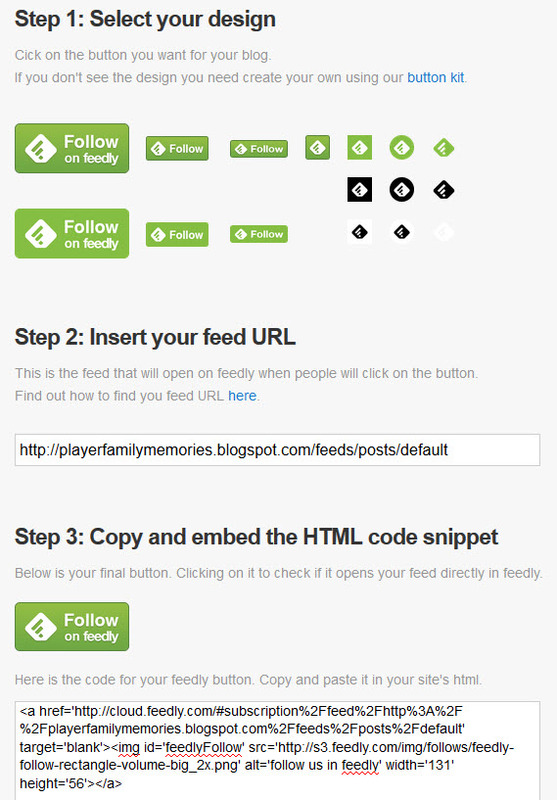 Feedly explains how to find your feed URL. -- STEP 3: Copy and embed the HTML code snippetThis page automatically generates the code. I guess today is my day for sharing technology ideas, eh?